Asian lacquer table-ware, pottery and porcelain are well-recognised internationally, and I believe some of Japanese ones are also famous as arts. Of course, if we could own such arts, that will be great. But if they will be offered as more common tools, it will be more widely loved by people? Today, I would like to introduce an article which write about such arts offered in more modern form of products. Have you heard of ‘Yamanaka-nuri’ lacquer tableware? 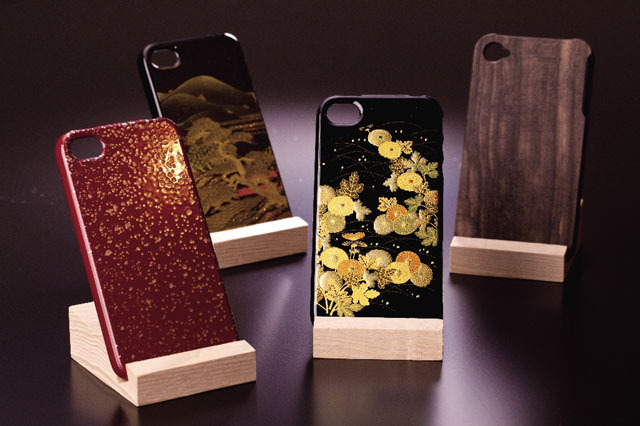 It is one of the most famous lacquer crafts in Japan, produced in Kaga-city. It typically has a delicate design with gold, and it’s gorgeous and luxury looking has been attracting people for a long time. Such beautiful tableware and tea ceremony tools can be too expensive for younger generation. But according to the article, Yamanaka nuri is now widely appreciated by people in their 30s and 40s as a mobile phone cover! There are countless varieties of mobile phone cases available in the market, but probably traditional crafts type are not so common?? So, it does look very unique as a phone case. It has been making a quite good sales in Japan; however, when Yamanaka-nuri mobile phone cases were brought to a department store in Singapore, it seems approx. 400 of those were sold in 2011, and there were other Asian traders who showed strong interest to import this product to sell in their country. So, it is obviously not just popular in Japan, but overseas as well!